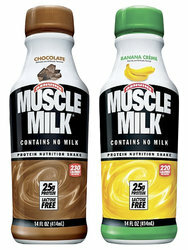 Muscle Milk Protein Nutrition Shake. A great source of protein that is ready to drink. Great before of after a workout or as a meal replacement. Each bottle is 14 oz and is lactose and gluten free. We offer 2 great flavors: Chocolate and Banana Creme.